#1 It suggests that my son and daughter did something, or worse, ate something to cause their diabetes. Type 1 diabetes is an autoimmune disease. 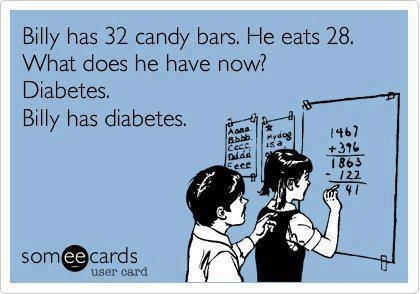 While we may never know exactly what triggered their little bodies to attack the cells in their pancreas that make insulin, I’m CERTAIN it wasn’t because they ate too many candy bars. #2 Diabetes is no laughing matter. My kids are in a constant battle for their lives. The list of complications from diabetes is too long to list. Blood sugars that are too high can result in comas and blood sugars that are too low or that drop too rapidly can cause seizures and brain damage. And as much as I don’t like to even type the word, both can lead to death. It’s a never-ending balancing act and diabetes seems to always have the upper hand. #3 Sugar, yes the same sugar found in candy bars, is a lifesaver. My children never leave our house without taking some type of fast acting sugar with them. Candy has saved their lives too many times to count. Eating sweets did not cause their diabetes but it certainly does play an important role in keeping them healthy and alive. #4 People with type 2 diabetes have feelings, too. What possesses others to poke fun at someone with a serious, life threatening disease? I’m happy for you if your body works the way it’s supposed to. Why make fun of those who aren’t as lucky? #5 And last but certainly not least, this picture isn’t funny because thousands of people with diabetes are forced to look at it and it is, yet, another reminder of the ugly stereotype they have to fight every day.